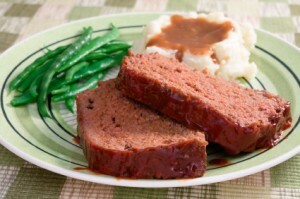 I have been craving comfort food, and one food in particular – my friend’s meatloaf. She makes hers with a healthier kick, using lots of shredded vegetables. I had never tried meatloaf with the veggies in it until I tried her. I loved it. So, if you are a meatloaf traditionalist, maybe you will consider trying something new when next preparing your meatloaf. In a large bowl, combine ground beef, bread, egg, carrots, onion, green pepper, celery, seasonings, and half of the ketchup. Form into a loaf in an un-greased loaf pan. Spoon remaining ketchup over loaf. Bake uncovered, at 350, for one hour, or until meat is no longer pink. Another idea: When in season, you can use shredded summer squash and or zucchini. I know there are SO many yummy meatloaf recipes. I just wanted to share one that was new to me. Hope you enjoy. I love the idea of using carrots in the meatloaf … why didn’t I ever think of that? I love comfort food too. I’m planning meatload for one night next week. It is actually one of the dishes my 7 year old requests! Thanks for sharing your recipe and for hosting this party. We never really eat any meatloaf in The Netherlands and i don’t think i have eaten any good meatloaf here yet… so maybe i have to try to make this dish and maybe i will fall in love! This is the PERFECT recipe that I need right now. Thank you! I’m starting a healthier eating plan and I’m going to add this to my menu plan. I love the idea of the shredded veggies in it. Awesome. I love the idea of the shredded veggies in the meatloaf. It sounds wonderful! Thank you for hosting, Lisa! My husband refers to things such as you adding shredded veggies to your meat loaf as “getting sneaky” ;-p A friend of ours adds shredded veggies and oatmeal to her sloppy joe’s. Meatloaf and mashed potatoes…you gotta love classic comfort food! I have a good friend who makes a similar meatloaf, and it’s not only delicious, but also nutritious! Thanks for sharing and thanks for hosting. So many good recipes to try this time. 🙂 Blessings! I love how you’ve used the veggies in the meatloaf. What a great idea! I’ve been craving meatloaf lately so I need to give that a try soon. Thanks so much for hosting. I’ve linked up my banana muffins this week. I’ve used shredded carrots in my meatloaf and hubby loves it. It makes a very moist meatloaf and the carrots keep it moist for the leftovers. Thanks for hosting and sharing your recipe. There are lots of great recipes this week. sneeky!! nice way to get those veggies in for those picky eaters! thankfully i don’t have any picky eaters at my house!! but this sounds good, just the same!! =) thnx! Meat loaf is one of my very favorite dishes. I’ll have to try your recipe. Love this recipe! It’s a great way to get kids to eat veggies without them even knowing it. I also used to add shredded carrots to mine when the kids were little. I love how you’re sneaking veggies into your food with the meatloaf here. I really love the additional flavor that carrots add to various dishes. I just need to remember to use them more! Hey girl. Did My. Linky go away? I know it has about a week then closes. I’ll check on that. wow you have 143 entrees !!! First time in your blog and linked one of my very simple dish. Will visit tomorrow again. We love meat loaf and I always bake potatoes when making it. the next day we have home made hash . Fantastic.